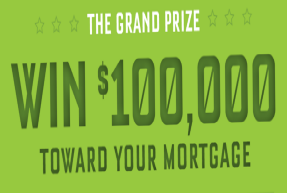 Quicken Loans Rocket Mortgage Push Button, Get Stuff Sweepstakes -Win $100,000! ENTRY LIMIT – After you successfully enroll in any initial Quikly campaign, you are not allowed to enroll for any subsequent campaign/drawing unless information is posted at http://pushbuttongetstuff.comstating that prior participants are allowed to enter a particular campaign. ELIGIBILITY – Open only to legal residents of the fifty (50) United States and D.C., 21 years of age or older. SWEEPSTAKES ENTRY PERIOD – The Sweepstakes begins on 1/27/2016 at 7:01 am Eastern Time (“ET”) and ends on 2/10/2016 at 11:59 p.m. ET, or when all five Quikly campaigns associated with the Sweepstakes have been completed, whichever occurs first. PRIZES – GRAND PRIZE: One (1) grand prize winner will receive $100,000, awarded in the form of a check, which winner may use to pay toward his/her home mortgage, if any, or for any other purpose. See rules for the rest of the huge list of prizes!